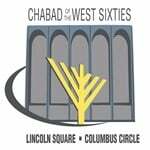 Chabad West Sixties Annual Simchat Torah Bash! At the Chabad Shul at 310 West 75th Street. * 7:30 pm (and on!) Hakafot, Dancing with the Torah, Buffet Dinner and lots of L'chaims! Bring your friends, bring your family, and most of all bring yourself! * 11:30am Hakafot (dancing with Torah) begins and Buffet opens. "On Simchat Torah, we rejoice in the Torah, and the Torah rejoices in us; the Torah, too, wants to dance, so we become the Torah's dancing feet." To learn all about Simchat Torah and why it is an incredibly joyous occasion click HERE. Looking forward to celebrating and dancing with you!